If you have any unexplained fish deaths or listlessness, always check the water. First check for nitrites and ammonia particularly in a new tank or one where the fish load has been increased, or the filter might have been compromised. In an established tank, they should be nil. Alkalinity and hard water is the only water quality issue that I face; this is a severe restriction on which fish I can keep. I live in London. We have very hard water here. Initially the tank pH was around 8, the same as my local tap water, but after a year it has crept to 8.6 which is unacceptable. A pH of around 7.5 will be better for my community tank, although most of the fish in it can cope up to 8.2. I tried using Proper pH 7.0 which is a sachet of powder, and will buffer the pH to 7.0, that is it will push it to 7.0 from whichever direction is required, acid or alkali, and hold it at that value. Proper pH has two problems - firstly, it will reduce trace elements in the water, so that eventually plants will yellow and die. I am now adding a few drops of an aquatic plant food which I am told can be added to the tank with no side-effects, and which will help the plants. Secondly, in hard water, the pH treatment will cause a white precipitate, or cloudiness, in the tank. This is harmless, but any cloudiness in the tank will make it harder for the fish to breathe. I have worked around this by adding sachets in tiny amounts rather than tipping in at once, and by adding it to the area of water near the filter so that the precipitate is sucked in right away. This kept it to an acceptable level as the sachet was added, although a white haze formed after a few hours. To reduce this, I use a water softening pillow, which is a cloth bag containing chemicals, which sits in the filter section and treats the water over several hours. This has removed the white haze, although it took more than 24 hours before the water was crystal clear again. If it is a real concern you can also buy a filter aid chemical. However the softener pillow really only changes the ions in the water, it does not truly reduce hardness. The hardness of the water affects the chemical buffer which keeps pH stable. It is easier to change the pH of soft water. In my hard water, even though I only added a small amount of Proper pH, in order to try to make the change gradually, the pH snapped from 8.6 to 7.0 in a few hours! Then a few hours later it snapped back to 8.6. Luckily the fish seemed lively and quite well, but it is more important to maintain a stable pH than to bounce about. I am now using pH down which reduces pH in gentle stages, so that you can control the change. It should be no more than 0.2 of a pH per day, so as not to shock the fish. However you will need your water to be medium soft before you can change the pH effectively. If your tank is too acidic, you can also buy pH up. Remember that bogwood may make your water acidic, and limestone rocks may make it more alkaline. 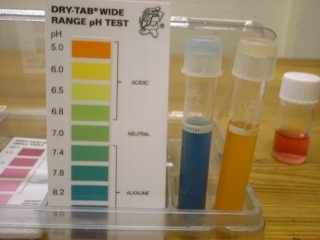 Check your pH regularly, and aim to keep it stable and within a suitable range for all your fish. 7-7.5 is ideal on a community tank. The eventual solution for me was peat filtering my water, which is described on the Marksfish site. It turns my water from pH 8.6, KH (hardness) 14 to pH 5, KH 1, which I can then mix with tap water to the desired pH. Easy! Tap water on the left, peat filtered water on the right! To learn more about what causes hardness in water, read my guide to water hardness.